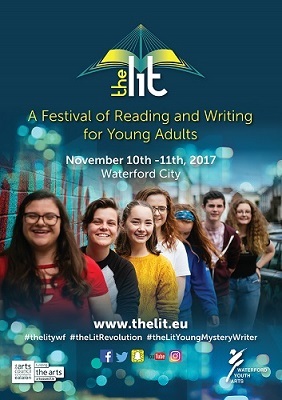 The Lit Festival of Reading and Writing for Young Adults will run from 10 to 11 November 2017 with lots of events and workshops for young readers and writers (aged 15 – 19), including Open Mic poetry and writer’s block workshops. The Lit Festival has gathered some impressive names for the festival, like Kevin Barry, Lisa McInerney, Claire Hennessy, Erin Fornoff, Dave Lordan and Colm Keegan to name but a few. The festival will run from 10 to 11 November 2017 with lots of events and workshops for young readers and writers (aged 15 – 19), including open mic poetry, writer’s block workshops, and even a special Irish Rail train trip from Dublin to Waterford. Events are all over the city, principally from Waterford Central Library, Garter Lane Arts Centre, The Parlour Vintage Tea Rooms. Waterford Youth Arts Ltd. The Arch, Old Military Barracks, Barrack Street, Waterford. This entry was posted on November 7, 2017 by waterfordarts in Arts Council, General, writing and tagged Garter Lane Arts Centre, Open Mic Waterford, Reading and Writing for Young Adults, Rogue Gallery, The Lit Festival of Reading and Writing, The Vintage Tea Rooms Waterford, Waterford Central Library, Waterford Festival.